Last week, Twitter CFO Anthony Noto offered a big long-term revenue forecast to get investors and shareholders excited about the company: He flashed a chart that suggested Twitter would be able to generate $US14 billion in revenue in about 10 years. 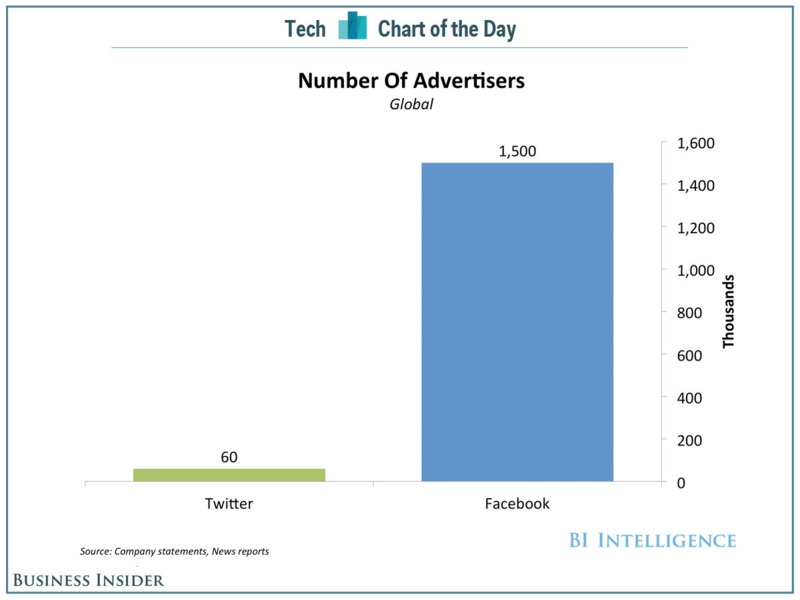 If Twitter wants to achieve its ambitious revenue goals, it will need to increase its number of advertisers and overall ad load. Based on company data charted for us by BI Intelligence, Twitter trails Facebook in the number of ads that appear in a user’s timeline — 5% for Facebook versus 1.3% for Twitter — and in the third quarter, Twitter claimed far fewer global advertisers than Facebook (60,000 versus 1.5 million).